It’s official, fall is here, and if the weather and calendar didn’t tip you off, then the return (after a brief hiatus) of Flick Friday should be a huge hint. I don’t know why, but this style of film-making immediately makes me think of fall. 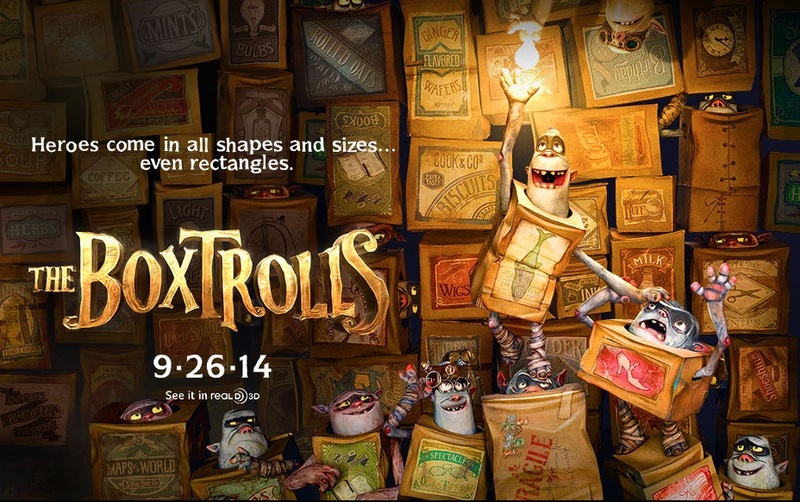 Although I assume it has something to do with Mr. Burton’s tale of Jack Skellington, but back to the point—boxtrolls. What is a boxtroll? They’re trolls that live in boxes (like turtles live in shells). At night they comb through your garbage, looking for discarded treasures to tinker with, and build new marvelous things. That is after they steal your children and peel their flesh from their bones. At least that’s what they believe in the the town of Cheesebridge. In the town Cheesebridge, everyone knows that boxtrolls are monsters. They’ll steal your children and grind their bones for bread…you get the picture. Ever since the Trubshaw baby was snatched in the middle of the night, never to be heard from again. And that story came directly from the mouth of Archibald Snatcher (Ben Kingsley), a sinister looking man who’s since made a living exterminating these “pests,” and working his way towards earning a white hat a seat at town leader Lord Portley-Rind’s (Jared Harris) tasting table—both symbols of elite status in the town of Cheesebridge. So, it must be true, right? There is one boxtroll that’s a little bit different from the rest—Eggs (Isaac Hempstead Wright). I forgot to mention, boxtrolls are of course named for whatever it is their box once stored. Eggs grows up with the boxtrolls, raised by Fish (Dee Bradley Baker) and completely unaware of his condition until one day he meets Lord Portley-Rind’s daughter, Winnie (Elle Fanning), who diagnoses him as a proper boy. Eggs’ human-ness is met with some denial, but soon accepted and followed by a new-found drive to save his boxtroll family from Snatcher and clear their name. If you don’t yet appreciate the amount of work that goes into this kind of animation, make sure you stick around for the final credits, where they brilliantly illustrate just how much time and attention to detail this takes. On behalf of your audiences, I thank you animators. It is truly wonderful.